Does this look like Bloat to you, or is this fish just fat? 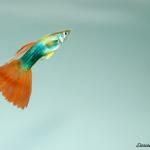 Do you include fiber in your fishes' diet? If not, you should. Just like people, fish need a source of fiber in their diet. Once a week, I feed frozen, organic spinach to my fish. Some tank keepers prefer to use peas, but you have to take the skin off. Spinach is much higher in fiber than peas. Just drop some pieces into the tank. My fish really like it. This will keep your fish regular and healthier. No cooking is needed. Just make sure you use organic. Nothing but the spinach, no additives. Or you could buy Omega One super veggie pellets since your Cichlid is already used to eating pellets.